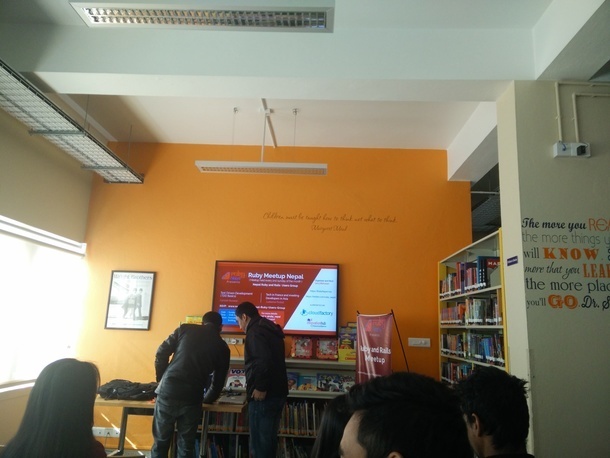 RubyNepal oraganized its final meetup for 2015 on 20th December, 2015 at Innovation Hub, FNCCI Building, Teku, which had been on hold for few months due to fuel crisis and all the crazy things going on in Kathmandu since past several months. This was my first meetup in Kathmandu and first Ruby meetup ever. The meetup venue was a small conference room for about 20 - 25 people. All the seats were taken as more people turned up than the organizers had expected. There was a short briefing by one of the organizers who introduced us to the speakers and the topics they would be talking about. The first talk was by Ludwine Probst, data engineer from France. She talked about how she got into software development and talked about her project on travelling to Asia and meeting different regional tech communities along the way. After a short 10 minutes break, there was another talk session on TDD Basics by Ganesh. He opened up with a question to the audience "How many of us sleep peacefully at night after working long hours writing the code?". As not many hands were up as a response, he started off with the advantages of TDD over traditional Design-Implement-Test architecture. Then, he talked about few gems for TDD (rspec, capybara, factorygirl) and demoed some examples on how to write specs for a feature before starting on its implementaion. It was a good experience overall to meet developers from the growing community of ruby/rails users in Nepal. However, there were a lot of eager participants on the meetup and the venue was little overcrowded and it would have been better if there were few more talk sessions.